When it comes to sharing files over internet email is not the only option. If you choose to send your files through email it may not be effective choice in all the cases specially when the data is more than 25MB in size. You can either split and send files over internet or you can choose another service like Send Tool. 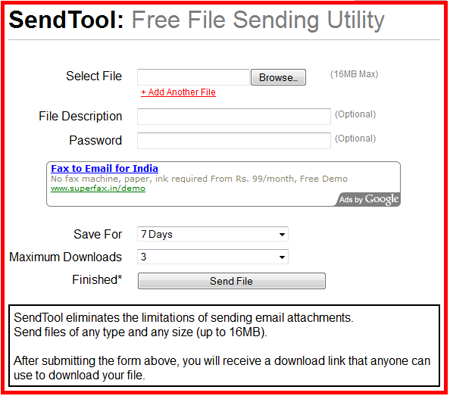 Send tool is a free file sending utility. It eliminates the limitations of sending email attachments. Sending files using send tool is really easy. Just browse for file/files that you want to send, give it a little description and password and submit the form. After submitting the form, you will receive a download link that anyone can use to download your file. You can choose to save the file for 1, 3, 7 or 10 days. You can also chose maximum downloads per file. I think it is the easiest way to send files over internet. In case you don’t like it much and want more such tools then you can read my another post on best websites to share large files over internet. .-= sudharsan´s last blog ..Revo -uninstaller =-.